Most of us are ignorant about fat. The moment we hear fat, we associate it with high calories, weight gain, obesity, heart diseases, etc. But, the fact is, we need fat in order to live! Having said the above not all fats are alike. The devil and angel concept applies here very well. We have good fats which are the essential fats and are needed for healthy brain functioning, immune system, hormone production, and energy production. There are bad fats too that can clog our arteries and lead to internal inflammation. All that we need to do is, choose the right kind of fat and consume it in the right way! Heard of MCTs aka Medium Chain Triglycerides? Well these good fats are gaining fame in the health sector these days. They have received considerable attention in the past too. 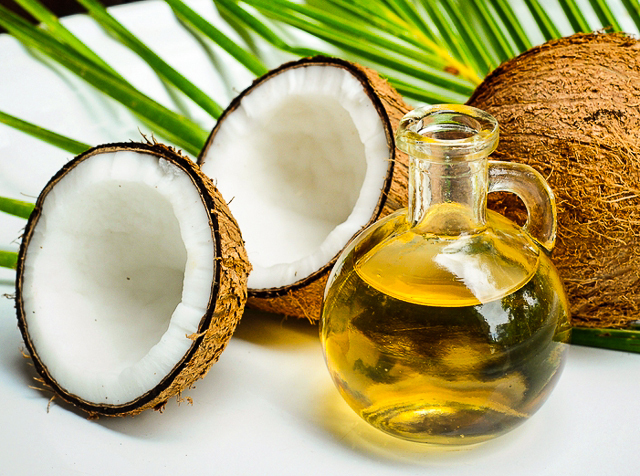 MCTs, are the major fat components in coconut oil. We can find varying amounts of MCTs in olive oil, ghee, palm oil, butter and nuts too. To understand why MCTs are so wonderfully beneficial for us, we need to get into a bit of chemistry. MCTs are composed of only 6 to 10 carbon links, unlike other fats which have up to 22 carbon links, and because of their shorter chain length, they are absorbed faster by the body and are quickly metabolized (burned) as fuel/energy. Thus, rather than getting stored as fat, the calories contained in MCTs are very efficiently converted into fuel for instant use by our body. This is one reason why most people are eager to get their hands on MCTs. Apart from being minimally stored as fat, MCTs are knows to induce thermogenesis and wake up the sluggish metabolism, which thereby accelerates the calorie-burning process. This makes it useful in case of Thyroid too, where the metabolism is terribly slowed down. MCTs reduce the glycemic index of the meal to which MCT Oil is added as they have a slight hypoglycemic/blood sugar lowering effect. It’s often said that fats are bad for heart. But, MCTs have shown to prove it wrong. Since they are metabolized faster, more like carbohydrates than fats, they provide instant energy to the diseased and stressed heart which is usually energy deficient. That’s not the only thing, MCTs also have an anti-coagulation and cholesterol lowering effect that safeguards our heart. MCTs are like rocket fuel to the brain as they release ketones when they are metabolized. Ketones are an efficient fuel for brain and can boost cognitive performance. Thus, MCTs are considered beneficial in case of epilepsy, seizures and alzheimer’s disease. Athletes usually depend on carbohydrates for instant energy. Carbs however provide lesser energy than fats. Since fats are absorbed slower than carbs, athletes choose to go for the latter. MCTs pick up the positive aspects of both- They are absorbed faster plus provide instant energy, which is an ideal combination to bolster an athletic performance. In conditions like liver and gastrointestinal issues, where absorption is severely affected, MCTs are a boon. After consuming MCT containing food, they are absorbed quickly from the small intestine and taken straight to the liver and are converted into energy without requiring a single drop of bile (produced by the liver), thus reducing the workload of the organs of an ill person. MCT containing oil is a super food for cancer as it heals the damaged cells, improve immunity and provide instant energy to the weak body. The benefits of MCTs are incredible, aren’t they? Now the question is how to use MCTs containing oil in our day to day life? Best way is to make use of coconut oil in your meal preparations OR you can bake some popcorn or foxnuts (makhanas) using ghee/coconut oil OR You can add it into your coffee or smoothie OR simply use it as a salad dressing. 1 tbsp a day is more than enough. Extremely informative blog Shimpli. These humble Indian ingredients are truly uncovered & needs good amount of promotion, unfortunately.